Giant monsters, mutant aliens, Frankenstein – all have one thing in common: hordes of screaming masses running away in fear and terror. There have been thousands of toys honoring the monsters, but what about the B-movie actors and actresses who shriek at them? 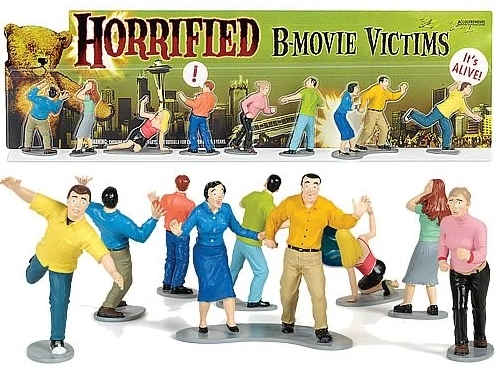 Now you can perfectly re-create your favorite monster movie diorama with these 3 1/4-inch tall hard-vinyl figures complete with blank stares, gaping mouths, open wounds, and missing limbs. Goes well with a Glow-In-The-Dark Flesh Eating Zombie Playset.